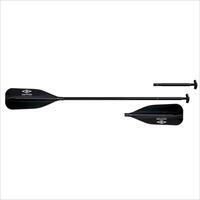 Use the Carlisle Taboo 2-Piece Adjustable Kayak and Stand-Up Paddle on a paddleboard or in a kayak thanks to the easy button-locking system that allows you to quickly change the length and add or remove a second blade. 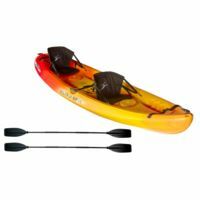 This two-in-one paddle is lightweight so you won't feel worn down before you get a chance to enjoy the water. Durable high-impact plastic blades and aluminum shaft mean that, in a pinch, the Taboo can take some bumps and bruises against the rocks. 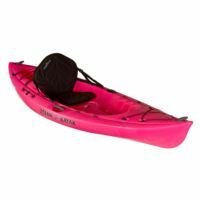 The Malibu Two Kayak is perfect for beginner and family kayakers. Extra stable, beamy, comfortable and almost impossible to tip. 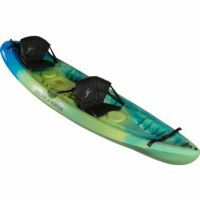 Three molded in seat-wells allow you to paddle solo, tandem, or with two adults and a child. MAX CAPACITY: 425 lbs. Paddle(s) sold separately. 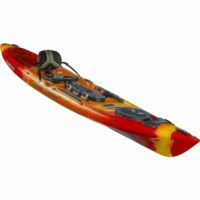 Have a blast atop the all-new Ocean Kayak Malibu 9.5! It's all about fun and comfort-and if you like to control your own destiny, it's got options. 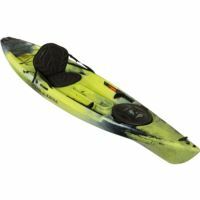 These compact, stackable, easy-to-paddle, straight-tracking solo kayaks will turn heads as you master the waves with ease on our super-stable 9.5' sit-on-top hull designs. Comfort comes easy on the Malibu, thanks to a newly designed AirGo™ molded-in seat and seat pad with an adjustable AirComfort™ backrest. MAX CAPACITY: 325 lbs. Paddle(s) sold separately. Have a blast atop the all-new Ocean Kayak Malibu 11.5! It's all about fun and comfort-and if you like to control your own destiny, it's got options. 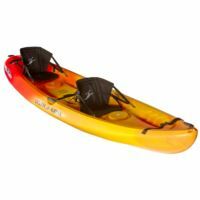 These compact, stackable, easy-to-paddle, straight-tracking solo kayaks will turn heads as you master the waves with ease on our super-stable 11.5' sit-on-top hull designs. Comfort comes easy on the Malibu, thanks to a newly designed AirGo™ molded-in seat and seat pad with an adjustable AirComfort™ backrest. MAX CAPACITY: 360 lbs. Paddle(s) sold separately. Dive in feet first with the Malibu Pedal. 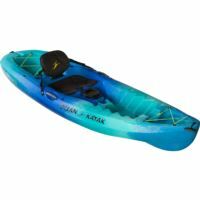 It features the advanced PDL Drive System that makes for a fresh new kayaking experience. It's fun, zippy, stable and has turn-on-a-dime performance. A kid's jump seat makes family outings a breeze, and it even has plenty of room to bring your dog along for a complete family adventure. MAX CAPACITY: 450 lbs. Paddle(s) sold separately. Fun on the water is the name of the game. That's exactly what you get with the Banzai, the sit-on-top kayak made especially for kids. The low-profile, kid-friendly seat allows easy movement and more mobility for small bodies. The Banzai's innovative Tag Along Tow System lets you tow your kids when they're too tired to paddle (though probably not too tired to splash). 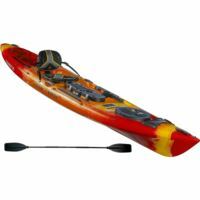 This playful and maneuverable kayak is perfect for kids who are just learning to paddle. MAX CAPACITY: 230 lbs. 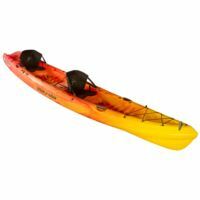 Includes kids paddle. The Caper is a compact sea kayak. 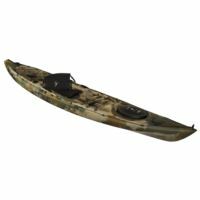 Stable and easy to maneuver, this kayak comes complete with a performance hull and storage options rare for boats this size. Suitable for most body types with a roomy cockpit and an impressive weight capacity. Don't let the size fool you – the Caper delivers big fun. Throw it in the back of your pickup and head to your favorite fishing or paddling spot. MAX CAPACITY: 325 lbs. Paddle(s) sold separately. 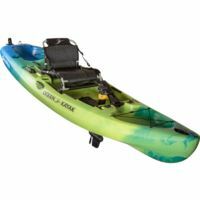 The ideal compact kayak, Ocean Kayak's Caper Angler is able to carry you to your favorite fishing hole or remote campsite. Suitable for most body types. Stable and easy to maneuver, with a high seat well to keep you dry. MAX CAPACITY: 325 lbs. Paddle(s) sold separately. 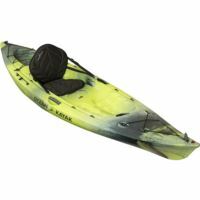 Sleek and sporty, the Tetra 10 Kayak is perfect for the small to medium build paddler. Compact and easy to maneuver the Tetras are equipped with the unique Comfort Hybrid seat back. Nimble and fun - perfect in a variety of water conditions. MAX CAPACITY: 275 lbs. Paddle(s) sold separately. The Tetra 12, the longer sibling of the Tetra 10, is a low profile craft with clean lines and a sleek design. It glides and tracks through the water with ease. Equipped with the unique Comfort Hybrid seat back the Tetra is ready to ride the minute you hit the water. MAX CAPACITY: 350 lbs. Paddle(s) sold separately. The Venus 10 is built for women of smaller stature to get the most out of paddling a sit-on-top kayak. 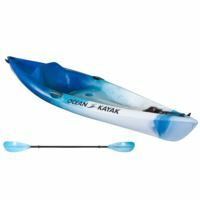 It offers a roomy seat well without being too wide for a comfortable, effective paddle stroke. Most importantly, the Venus 10 is extremely light (only 37 lbs!) and outfitted with the car-topping handle system that makes independent carrying and car-topping a breeze. MAX CAPACITY: 175 lbs. Paddle(s) sold separately. 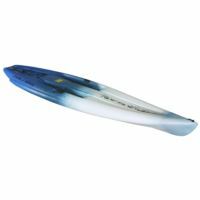 The Venus 11 is the slightly bigger sister of our popular and petite Venus 10 for women paddlers with a medium to large build. Still super lightweight for easy car-topping, the Venus 11 is built for fun with a slightly wider seat positioned to help the boat respond to a woman's center of gravity. 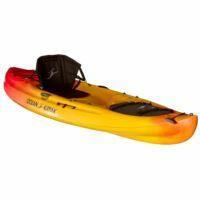 It's stable and suited for flat water, moderate ocean swells and waves or slow-moving rivers. MAX CAPACITY: 225 lbs. Paddle(s) sold separately. 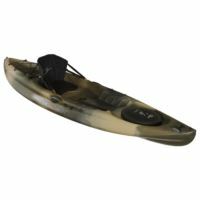 The Prowler 13 Angler is the perfect choice for kayak fishing. Features an enormous tank well and big bow hatch. The Prowler's length makes it perfect for strong paddlers to cover distances quickly, while its width creates stability and carrying capacity. MAX CAPACITY: 325 lbs. Paddle(s) sold separately. The ideal size for inshore and inland angling, with Trident's legendary ease of paddling. 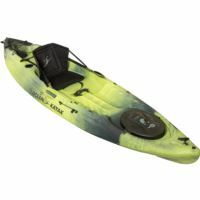 The Ocean Kayak Trident 13 Angler balances size with agility, making it the most versatile kayak in the fleet. The Trident 13 performs well in almost any water application but you'll notice the superb performance in breaking surf and rough seas. MAX CAPACITY: 355 lbs. Paddle(s) sold separately. Rated one of the most stable kayaks on the market, the Zest Two Exp is the perfect choice for a day trek or weekend adventure. Features molded-in storage, over-sized tank well, side-mounted carrying handles and cup holders. MAX CAPACITY: 600 lbs. Paddle(s) sold separately. Sit or stand, the 2019 Nalu 11 comes with a Comfort Plus Seat so you can choose! At 11 feet, the Nalu 11 is most at home in the ocean or on rivers – it's highly maneuverable and much tougher than a composite board. The lightweight, easy-to-transport Nalu 11 is a great choice for spontaneous paddlers. MAX CAPACITY: 275 lbs. Paddle(s) sold separately. 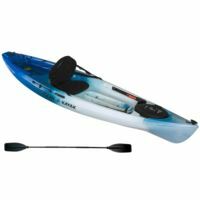 The Malibu Two Kayak is perfect for beginner and family kayakers. Extra stable, beamy, comfortable and almost impossible to tip. Three molded in seat-wells allow you to paddle solo, tandem, or with two adults and a child. MAX CAPACITY: 425 lbs. Includes (2) Standard Paddles. The ideal size for inshore and inland angling, with Trident's legendary ease of paddling. 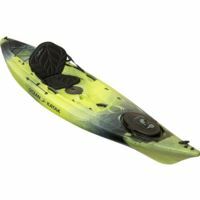 The Ocean Kayak Trident 13 Angler balances size with agility, making it the most versatile kayak in the fleet. The Trident 13 performs well in almost any water application but you'll notice the superb performance in breaking surf and rough seas. MAX CAPACITY: 355 lbs. Includes (1) Standard Paddle. 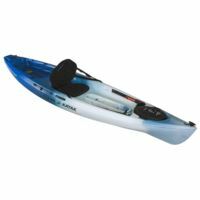 Sleek and sporty, the Tetra 10 Kayak is perfect for the small to medium build paddler. Compact and easy to maneuver the Tetras are equipped with the unique Comfort Hybrid seat back. Nimble and fun - perfect in a variety of water conditions. MAX CAPACITY: 275 lbs. Includes (1) Standard Paddle. 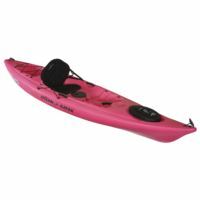 The Malibu Two Kayak is perfect for beginner and family kayakers. Extra stable, beamy, comfortable and almost impossible to tip. Three molded in seat-wells allow you to paddle solo, tandem, or with two adults and a child. No-nonsense Recreational Life Jacket. Created for utility, the Outfitter Universal offers a one-size-fits-all clean and simple construction at just the right price. MAX CAPACITY: 425 lbs. 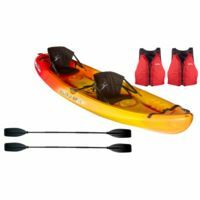 Includes (2) Standard Paddles & (2) Life Vests.